It’s difficult to surprise somebody by enormous impressive installations which appear in cities and small towns all over the world. But sometimes they are so unexpected that can really astonish by their simplicity and creative approach. I want to tell you about two green installations appeared last years in the capital of Peru Lima and in small French village Jaujac. 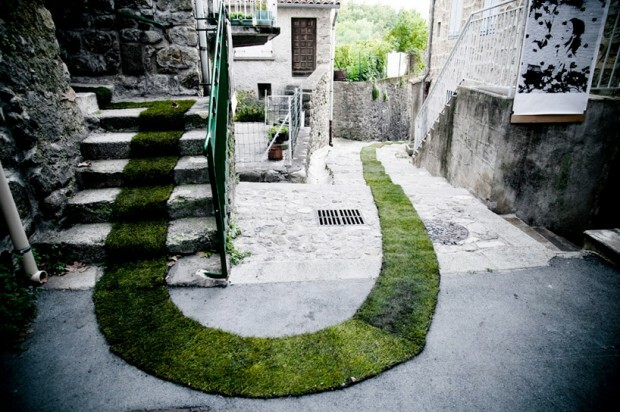 Marseilles artist Gaëlle Villedary created a project to support environment protection: almost all village’s streets and side-streets became a narrow grass-plot zones. Jaujac is surrounded by forests and rivers, but public spaces there seem very dejectedly. But this installation has covered the whole village’s centre and gave impression of a large park laid out here. It consists of 168 green rolls of total length of 1400 foots. These green paths weight 3.5 tons. Green paths represent amazing rapprochement of natural and city conditions. Children very liked this grass-plot and it became not only good decoration but very amusing attraction. 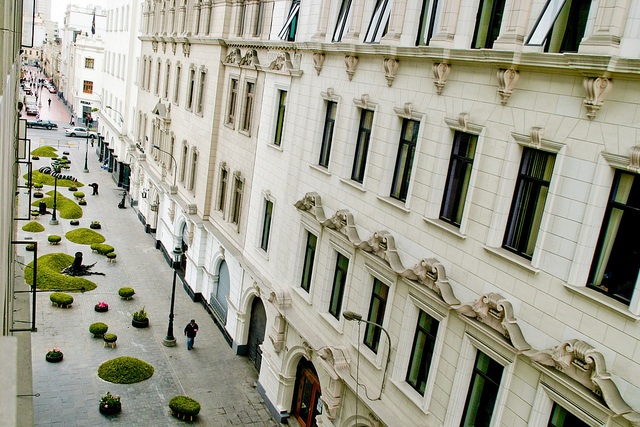 The second example of urban environment is Peruvian capital Lima. 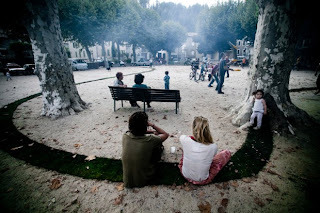 Some years ago a city authority announced a competition for the best transformation of urban space, and the project “Invasion Verde” (Green Invasion) won and was realized. Three Lima architects took into account a fact that Lima has very small square of green recreation zones. 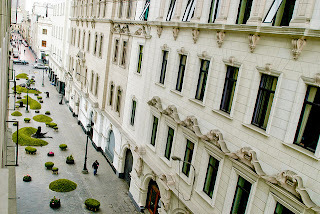 According to World Health Organization the green standard is 8 square meters per one citizen but in Lima it’s less in more than 4 times: 1.98 square meters. Creative group established a park right in the city centre on the Pasaje Encarnacion (Incarnation Street). Small knolls covered by grass and green sittings were very liked by people. During the building architects and designer used second materials: car tires, altered plastics, wood. Plants and grass also was selected carefully: they must be drought-resistant and maximally useful: they were combined a way to extract more oxygen. As a result ivy, money tree, betel palm and snake plant were planted. As you can see these two ways of struggle with gray city reality are too simple but very eficient. Unexpected creations can change environment image sharply and attract attention to a problem. There is also an interesting book about bringing dead streets back to life : Nicolas Soulier, Reconquérir les rues.